Goren Farm has been in the family since 1955 and was farmed as an extensive dairy farm up until 1990. Since then the fields have been set to hay meadows to develop a natural balance with nature. No chemicals have been used on the farm and no fields have been ploughed in living memory. Julian arrived at Goren in 2001; he was just 28, and had come from London where he had a career in IT and oil exploration. The farm belonged to an old family relative who had been living more or less as a recluse in a couple of rooms of the farmhouse which, although a listed building, was dangerously close to falling into dereliction. Julian had decided to come and live in this 70 acre plot of land and try to save the house and help Ken, but it was the meadows which were to shape the future path of both Goren Farm and Julian and his family. What had struck him about these fields was the complexity and variety of plants growing in them. Having been raised in a Devon farming family, he knew the signs, and he was inspired. The native wildlife had flourished over the years, partly due to Ken’s gentle and old fashioned approach. Rejecting modern farm machinery, all Ken had was a small blue tractor, a sickle, a billhook, a Devon shovel, a bowsaw and a mattock. Inspired by his meadow moment, and wanting to restore what remained of the formal gardens, Julian enrolled in a horticultural course at Bicton College. When a neighbour commented on the amount of weeds growing in the meadows, Julian began to wonder who might want the seeds and how he could utilise the diversity of native plant species growing naturally at Goren. It was only a matter of time before the wildflower business began. The ecological balance in the fields has been complemented with a herd of Ruby Red Devon cattle and a small flock of Polled Dorset sheep. Hedgerows are managed to produce wood and allow a habitat for wildlife, as well as providing shelter for the farm animals. The orchards have been restored and replanted with new saplings among the veteran trees and cider is produced in the traditional way, filtered through straw. Now that the new trees bear fruit, apple juice has been brought into production too. The water supply for Goren originates from a spring line mire and is tapped using a labyrinth of stone drains buried under the fields. 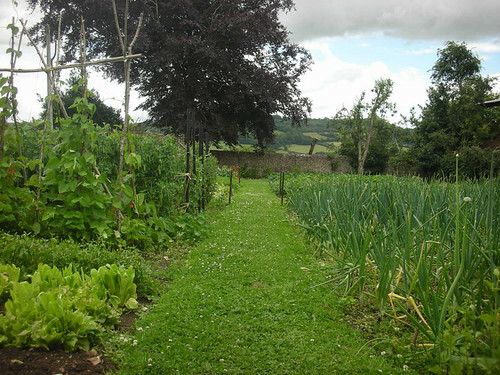 The walled area has been restored as a vegetable garden and some of the produce is sold locally. Most of the buildings date back to 1820 or earlier and have changed little. Careful restoration of these buildings is underway, utilising local materials and traditional methods. The wildflower meadows are open to the public throughout June and events are held over the weekends with paths cut through the meadows to wander and enjoy - this is in collaboration with the National Garden Scheme and proceeds go to charity. Wildflower seed is harvested directly from the ancient meadows from 1st July and sold to private individuals, local community groups and the National Trust. The farm uses enthusiastic volunteers throughout the year, recruited through the ‘willing workers on organic farms’ scheme, (WWOOF). The aim is to keep working the farm using the traditional methods and share the experience gained with customers and the community alike. In 2009/10 Goren Farm was given a commendation in Britain's Most Beautiful Farm Awards at the House of Lords, which they were honoured to receive. This was awarded on merit for conservation, sustainability and profitability in farming. Small pet hay of very fine grasses which grow naturally on the old moor. Vegetables and fruit in season.